I recently learned that Australians have over $32 billion in credit card debt. Yes…billion, not million. But wait, it gets worse. That’s just the debt. On average, Australians are paying more than $15 million per day in credit card interest. Ouch. Here’s the thing: credit cards are a bit like…the Matrix. They seem like they’re great, people have a grand old time, but really…it’s a bit of a hoax. Credit card companies are playing us. And the only way to really win the game, is to pay off the credit card completely every. single. month. so you don’t accrue credit card debt. When you pay on credit card, you’re borrowing money from the credit card company, right? Then, at the end of the month, you’re only required to make the “minimum repayment”. This minimum repayment is usually very low. It’s usually about 2% of the balance. That means, if you spend $1,000 on your card, you only have to pay $20 at the end of the month (i.e. 2% of $1,000). Hurrah! You got $1,000 worth of stuff and you only had to pay $20! What it actually means is that you now owe the credit card company $980 plus interest. The credit card company will start charging you interest on the amount that you have not paid. Credit card debt is some of the most expensive forms of debt there is. Interest rates are stupidly high. The average interest rates on credit cards in Australia is about 16 – 17%. You could get a loan from a bank for a lower interest rate than credit card debt. So let’s go back to that example. If you spend $1,000 on a credit card and decide you only want to pay the minimum balance, it will take you more than 7 years to repay the $1,000 credit card debt. On top of that, by the end of the 7 years, you will have paid an additional $751 in interest. AND that’s assuming you don’t make additional payments on that card after the initial $1,000…which is like, pretty unlikely right? So, you almost paid as much in interest repayments as you did on the initial purchase. Most people use credit cards for everyday items like groceries, clothes, entertainment. Is that stuff so important that you’re willing to pay almost double the price? Every now and then, I’ll hear someone justifying their excessive credit card use with the reward points they earn. And look, reward points are a legitimate thing. Some people are able to really get a lot of value out of their reward points. However, a lot of people get a false sense of reward by earning the reward points, but aren’t able to convert those points into actual savings. This comes down to: how much do you burn vs earn? In other words, how much do you have to spend in order to actually earn enough points to justify the spending? Let’s walk through some examples. Firstly, the best rewards cards charge an annual fee. So if you’re going for a no-annual-fee card, it’s probably not going to give you the best value in terms of reward points. For example, the Coles No Annual Fee Mastercard is a pretty basic credit card, good for people who don’t want frills and fancy things. With the Coles Mastercard, you earn 1 point for every $2 spent, and for every 2000 points, you get $10 worth of groceries. What’s the burn vs earn? You had to burn $4,000 to earn $10. Definitely not something to get ‘spend happy’ over. In comparison, let’s look at the American Express Explorer. The annual fee is $395 and you get 2 membership points for every $1 spent on most things (not including government bodies). 4 membership points converts to 3 frequent flyer points for most programs, so 10,000 points = 7,500 frequent flyer points. A one-way flight from Sydney to Melbourne is just over 7,500 points with the Virgin Velocity Program. Depending on what flight you catch, that trip will cost about $200 – $300 as a full-price ticket with Virgin. So the burn vs earn? You had to spend at least $5,000 + the $395 card fee to earn enough points to fund a $200 – 300 one-way economy class domestic flight ticket. And let me be clear: there is absolutely nothing wrong with that if you were going to spend the $5,000 anyway. What you don’t want to do is get ‘spend happy’ because you think you’re earning points, when you actually need to earn a lot of points before you can actually redeem them for something. You need to be very mindful of the ‘burn vs earn’ to make sure that what you’re getting in rewards is actually worth what you’re spending to earn them. And that brings me to the psychological game. 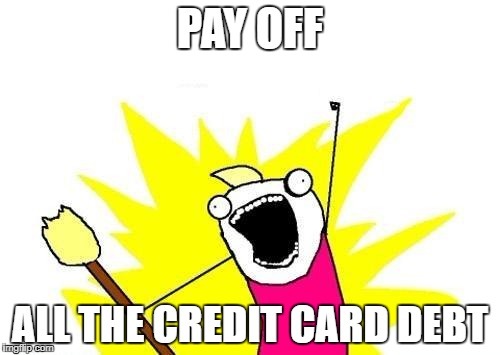 If everyone knows it’s bad, why is it so easy to get into a cycle of credit card debt? Part of the reason is that credit card companies have gamified the credit card process to make the experience of spending money on a credit card feel good. You feel rewarded for using your credit card, so your brain develops a positive association with it. For a lot of people, it feels better to spend on credit cards than it does to spend your own money. If you don’t believe me, look at the average amount Australians spend on a credit card ($112) vs on a debit card ($50). People spend more than double when they purchase on a credit card, than when they purchase on a debit card! It’s as though people get ‘spend happy’. So, not only do people get into a cycle of debt with credit cards, but they spend more than they would have if they were using their debit card, or cash. Partly because they feel like “it’s not their money” so they can spend more of it, and partly because it feels good. This creates a spending ‘habit loop’. You spend money, you feel good, so you spend more money. It’s easy to get into a dangerous cycle of spending. Long story short: the only way to use a credit card to your advantage is if you pay off the entire balance each month. Credit card companies make it so easy to not pay the full balance, with minimum repayments and positive reinforcement for spending, but you have to remember that it is in their benefit not yours if you have a credit card debt. If you pay it off every month, you can keep accruing points without accruing debt and interest.